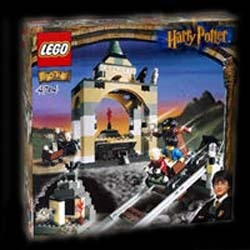 Gringotts Bank is one of the best Harry Potter sets to emerge from Lego's vaults. Not only is it a pretty impressive set, but it also includes a great collection of extras. These include coins, scrolls, money bags, keys, a mouse, two owls, a bat and four Lego characters (including Harry, Hagrid and Griphook). Fans of this series will be glad to see that the usual attention to detail has not been spared - in fact if anything Lego seem to have hitched this up a notch as they give us a truly detailed kit. The instructions are simple enough, and there are more than enough pieces to constructed an entirely different set of your own design. Another fantastic set from Lego.